4" x 9", full-color rack card printed both front and back. Front side has information reminding people of the importance of their service as a fully informed juror. Back side has a flow chart guiding the reader through questions to consider in determining whether jury nullification is called for to deliver a just verdict. Click here to download a .pdf master file for printing. Full color, letter size (8½" X 11"), trifold, general purpose brochure explaining the basics about jury nullification. Your Jury Rights: True or False? Full color, letter size (8½" X 11"), trifold, general purpose brochure explaining the basics about jury nullification. 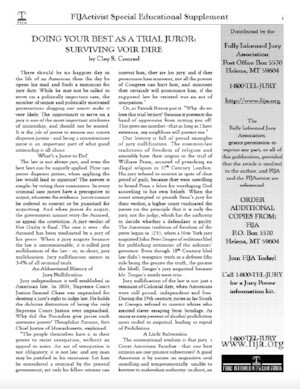 Directs the reader to FIJA's online quiz educating them about the importance of jury rights and service on a jury. Full color, letter size (8½" X 11"), trifold brochure focusing on how conscientious acquittal can be used to defend your right to ownership over your body, including the food and medicine you consume, your right of self-defense, your peaceful work and recreational activities, etc. Full color, letter size (8½" X 11"), trifold brochureexplaining how jury nullification can be used in defense of our rights to keep and bear arms. Green type and images, legal size (8½" X 14"), quadfold, general purpose brochure in .pdf format in question and answer format addressing common, but difficult questions about jury service. Suitable for black and white printing, but may require changing your printer settings to do so. Black type and images, ledger/tabloid size (11" X 17"), bifold brochure discussing what everyone needs to know about how to get on a jury when they are called for jury service.